4 comments to Don’t Forget To Register for BBAW! good luck. I did enter. I just hoping to make it to the final round of voting. I have a feeling that I’m in a much more competitive category this year, though. 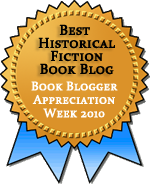 Good luck Meghan – you definitely have had an impressive array of historical fiction posts! I haven’t done mine yet. Still not sure if I am going to put myself forward in a particular category or not. I guess I need to hurry up and decide. Yay!! I’m glad you’re entering. You made the right decision in terms of helping out. The behind-the-scenes work can get intense.